Today I drove farther down Independence Boulevard than I have in a long time. I passed Independence Shopping Center and saw that a Roses store is opening soon. After getting over the surprise of seeing a Roses, I began reminiscing about the store from my childhood. I remember Roses as being third in the discount store chain hierarchy. At the top was K-Mart, followed by Wal-Mart, and then Roses (this was before Wal-Mart was the monster it is today). In Sumter, South Carolina, the area in which I grew up, there were all three stores. The Roses closed when I was around 10 or 12 years old, but I remember it vividly. I remember the ugly brown shopping carts. I also remember that Roses was our go-to store for back-to-school supplies because it would have the cheapest sale prices. There would be packs of paper on sale for something like three for a dollar. Three-prong folders, which many teachers required we have, were five for a dollar. And binders, tablets, and pencils were also ridiculously cheap. Because there would be limits on the quantity you could buy, my mom would give each of us money to go through checkout by ourselves. We would literally buy enough supplies to last the entire school year. At the time the Roses closed in Sumter, many others were closing around the Southeast. The stores could be found mostly in small Southern cities and towns like mine. And when they closed, the long, rectangular buildings often became abandoned eyesores that were hard to fill. The Sumter building went through a couple of incarnations and was finally resurrected as a Beacon 10 Cinemas, giving us a much-needed "big" movie theater (you have to understand my small-town upbringing). Apparently, all of the Roses didn't go away. 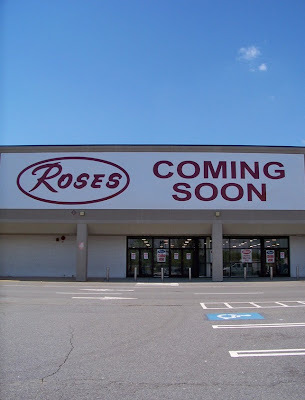 While today there are only a third of the number of stores there were when the franchise was at its peak in the early 1990s, there are more than 40 Roses stores in North Carolina, according to its website. I was surprised to learn that because I haven't seen a Roses in probably 15 years. Most of the North Carolina stores are in small towns and this is the first one in Charlotte in a long time. The new Roses is scheduled to open May 28 and is located in the Independence Shopping Center at 5704 E. Independence Blvd. I'm from Martinsville, Va and there is still a Roses there. In fact, I worked there one summer while home for college. It's definetly the poor man's Kmart. The retail hierarchy in terms of quality, IMO, is: Target, Walmart, Kmart, then Roses. But I'm sure there are other regional Roses-like stores in other parts of the country we don't know about. I grew up going to Roses in Asheville. The store there closed in the early 90s, I think. I went in the Independence Roses today to look around. I can best describe it as a cross between Big Lots and an old K-Mart. I think Roses will do well due to the amount of people living within 2 blocks of the shopping center that don't have cars. This store has a little bit of everything at inexpensive prices. It's not the Roses I remember, but I think it's an asset to the shopping center. The store is nice, bright and clean, with lots of people working there. I live in Roper, NC ( a small town about 1 hour from the Outer Banks of North Carolina). In our neignboring town of Plymouth, NC a Roses opened up this year and we could be happier. Because I live in a small town, we have to drive 30 minutes to an hour to get to a Wal-Mart superstore. Roses was a welcomed addition after the closing of the Maxway store and Ames (remeber that one?) when I was eleven. Although the quality of some of the mechindise is questionable, you can always afford to buy more! I love this store! hey im from rocky mount nc and we had a roses in the early 1990s during the same time Montgomery Ward (remember that 1?) was still in business they closed down around the same time after Hurricane Floyd but I was surprised myself to see they are opening one back up around here as well!!! Obama is doing the damn thing!!! ^_^ YES WE CAN!!!!! Hi,There are 2 roses on the Eastern Shore of VA - one in Exmore, VA and another in Onley, VA where I currently live after moving from NJ. This past week we have been in NC and have found several former Roses in small towns. These buildings now house other businesses. One in Warrenton, NC is an Italian restaurant; another in Littleton, NC is an antiques place. And, the original Roses in Littleton, NC is now a florist shop. I photographed several os these including the original Roses in Littleton, NC. the roses in weaverville is still there, and is not going out of business anytime soon. be before it built an eyesore of a shopping complex with useless stripmall stores where a wooded area (great for a park!) used to be. Aside from the Fleet Feet, there is no useful shopping here. I buy almost all my clothes and housewares online. If only we had some midscale shopping like a Bloomingdales. I'll not waste my time wishing for a Neiman Marcus or Saks. We certainly don't need any more bottom barrel discount stores selling cheap Chinese crap.